Sometimes you just don’t feel like cooking and you have to resort to an easy, pre-made meal. At BJs Wholesale Club, one of my housemates and I stumbled upon Grains and Quinoa Salad with Cranberries and Almonds by Betty Crocker. It looked healthy, easy enough to make, and had four packages in it so we decided to purchase it. When we finally made it we were so happy we decided to buy it. All you have to do is boil water and mix everything together – it’s the perfect dinner to make when you’re too lazy to cook but want to eat something healthy. Although it is easy to make, it does take a bit of time. You need to boil a pot of water and once it begins to boil, stick the still packaged bag (yes, leave it in the bag) of grains in the pot for 17 minutes, and flip it over once during that time. The only other thing you have to do though is put the seasoning mix (not the cranberries and almonds mix. I made that mistake the first time I made this although it didn’t make much of a difference) in a bowl, and mix it with one tablespoon of olive oil and one tablespoon of water. Once the grains are finished cooking, it’s going to tell you to keep the grains in the bag, place the bag in a strainer, and rinse it off well with cold water for a few minutes. I did this the first time I made this and it turns it into a cold dish. I tried it cold and it was delicious, but I was making it for dinner and I prefer to have warm meals for dinner. The second time I made it I skipped that step and just let the water drain out of the bag a bit. All you have to do next is take the grains out of the bag and place them in a bowl, and then mix the seasoning in along with the cranberries and almonds. Voila! Super simple. Since we kept the dish warm, we decided to add a touch of Sriracha to add a little spice to it. It was surprisingly very good, and the flavors mesh much better than one would expect. The dish is great on its own but if you like your food to have a little kick, I would recommend the Sriracha. My housemate and I decided we would split the one bag (I would say each package can be split by two people) and make some vegetables to go on the side. 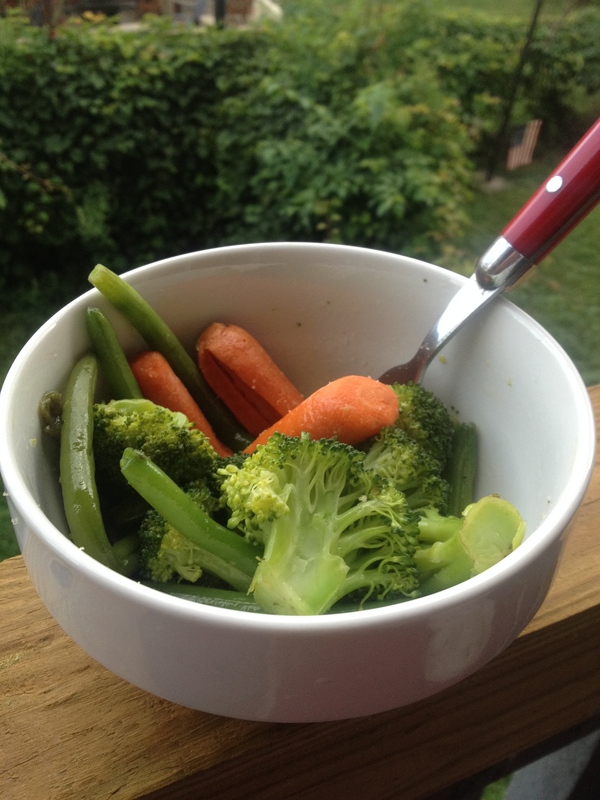 We ended up steaming some carrots, broccoli, and green beans. We don’t have a steamer so we placed some water in a pot but only enough so that we could put a colander in the pot and not have the water reach the colander. Once the water began boiling, we placed the vegetables inside the colander, put a lid on top, and let them steam for about 15 minutes. You know they’re done when you’re able to easily stick a fork through the vegetables (especially the carrots and broccoli). Once they were done, we seasoned them with some olive oil and garlic salt to taste. We ended up having a delicious and nutritious meal with minimal work on our part. The Grains and Quinoa Salad with Cranberries and Almonds by Betty Crocker was also under $10 and you get 8 meals out of it. In addition to it’s simplicity, it’s also a cheap meal. It tastes great and is very flavorful between the cranberries, nuts, and seasoning. I plan on keeping this stocked in my house.